MATABELELAND South Provincial Affairs Minister, Cde Abednico Ncube, has said former president, Mr Robert Mugabe’s continued dalliance with the G40 cabal in the formation of the New Patriotic Front shows that he cannot be trusted. Addressing Zanu-PF supporters at Nhwali village in Gwanda South on Wednesday, Cde Ncube said the NPF, which is led by Retired Brigadier General Ambrose Mutinhiri, was not formed to pursue the people’s interests. “You see Robert Mugabe, he recently formed a small party of his called the NPF that is composed of those G40 members who wanted to destroy the revolutionary party. This shows that he is a person who can never be trusted because of changing sides so easily. These are the same people who have caused suffering in this country and they want to lead the people again,” he said. Cde Ncube said disgruntled members of the G40 cabal should hang up their boots as their politics do not resonate with the masses. 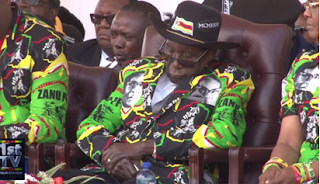 “Mugabe was removed from office by ordinary Zimbabweans and here comes Mutinhiri, a sell-out, to lead a party that is backed by such kind of person which shows they have their own motive other than championing the aspirations of the masses,” he said. Cde Ncube urged Zanu-PF supporters not to be misled by the G40 cabal. Instead, he said, the people should bear in mind the pain they suffered when the cabal had an advantage in Zanu-PF before their expulsion in November last year. “The current President, Cde Emmerson Mnangagwa, is very different from them. He is a leader with the people’s needs at heart. When he is among the people, he treats them with honour and respect because he is not a pompous leader,” said Cde Ncube. Cde Ncube’s sentiments follow calls by analysts this week for Mr Mugabe to follow former South African President Cde Jacob Zuma’s footsteps, who after being recalled from Government by his party, has remained loyal to the ANC. Cde Zuma over the weekend pledged his support for the ANC and promised to campaign for the party ahead of the coming elections while Mr Mugabe is fronting a new party at the age of 94.